I hail from non-celebratory stock that relishes holidays with sleeping in and watching excess amount of T.V. Birthdays by family rite are uneventful. Of course, there were those requisite years where birthdays had some sort of cultural significance. 18 was the year of college and fake IDs. Your first amaretto sour is always the best. Apart from falling face down during a funk concert at Madam's Organ, much of the 21st is a blur. And the quarter-century sparked the obligatory crisis over Modelo Especial. But 26 turned out to be pretty damn memorable—the year of cocktails and cupcakes. The lovely Romina, pastry chef extraordinaire and good friend, hosted a party at her patisserie. In addition to being a goddess of kouing aman, she's also the High Priestess of Cupcakes. In fact, she's been plotting a cupcake revolution ever since she opened her patisserie. Valrhona chocolate cupcakes, Madagascars (vanilla with vanilla cream cheese buttercream), Some Like It Hots (cinnamon Red hots baked into a vanilla batter), or my favorite, Margaritavilles (need I say more) have been tempting me since I first walked into her place. But there's more to them than cool names. These mini cakes have some serious FLAVA. They're still a hidden treasure in these parts—their small size is utterly foreign to folks who consider a bear claw the size of their head as "small." But I figure, until these cupcakes become the coolest thing since three-layer Jell-O to take over the city, there will be more for me. Last Friday, she baked up a few of the Maragaritaville cupcakes, prepared some lime curd, and margarita buttercream. We dubbed it the "Cocktail and Cupcake Fiesta." 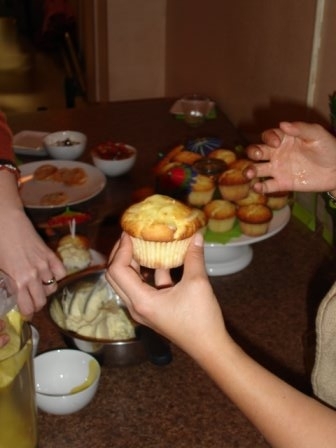 With a properly stiff margarita, folks each grabbed the naked cupcakes and dressed them at will. The buttercream you could eat by the spoonful. But the lime curd is so addictive you could it lick off of the floor. She had it sitting in a pastry bag with a big tip to poke through the top so that the cupcakes could be filled. Impaling should really be part of any cake decorating process. It's messy. And there's plenty of lime curd to lick off of your fingers. Save for the bowl of pearl sugar and colorful cocktail umbrellas Romina brought to decorate our creations, all this interactive fun made for some sad looking cupcakes. It wasn't hard to spot the pastry chefs in the room with their neatly slathered buttercream and perfect curd-squeezing technique. Patrick here is a computer programmer, not a cake decorator. Pretty or not, our personal little creations were insanely good. And after taking a look into my third cupcake, I think the real party was actually waiting inside. You haven't lived until you inhaled a Margaritaville cupcake followed by a Salty Margarita chaser. It only took me 26 years. There is such a thing as smooth tequila—be sure to use it here. Invert the chilled glasses in lime juice or water to moisten the lip and rub this wet bit into your sugar-salt mixture. Next, add desired amount of ice into the glasses. Pour in tequila, cointreau, and lime juice. Serve with silly umbrella. NOTE: There will be no recipe for Margaritaville cupcakes. Romina is insanely busy with other clients' cupcakes. 5,523 to be exact. So I haven't come around to asking her in this crazy production schedule. But I'm happy to report that Cupcake Revolution will be televised. Btw..I just got the mail & it was sooooo yummy! =) Thank u sooo much I was thrilled! Hopefully your mail will be equally yummy in a few days!! Have a great weekend! Hey happy birthday Vanessa. Hope it was a good one. Sounds and looks absolutely delicious! Happy Birthday! Margarita cupcakes?!! Are you kidding me? Seriously? You wicked, wicked girl. I must have one. Happy Bday, Vanessa! Cheese Sandwich day - February 16. Pass it on. Jaay—lol, no worries on the "blonde" moment. I was more focused on the cupcakes anyway, they're much more interesting than me :) and I'm so glad that you liked the ginger! Rorie—see what treats await in the Jell-o belt? Kalyn—thanks. and i'm in for the 16th. dwight—give it time. soon, we will overtake the world with good fashion and design sense and fantastic food. Romina sounds like a VERY good friend! Happy Bday! Happy Birthday Vanessa! Looks like you had a great time! Happy, happy Birthday! Those cupcakes look amazing!! Hey V-did you see your cupcakes on Blogher? Hi - I found your blog via blogher. I also had a birthday this week and also had a cupcake party. Mine was cupcakes and champagne which is a great combination (margaritas sound so good too). Fifteen bottles of champagne and 5 dozen cupcakes later, I think everyone had a good time (ha!). I wish I'd thought of having people decorate their own but I fear my carpet wouldn't have survived. Happy birthday! My God, lime curd? That was an instant saliva trigger. happy birthday v-chang! Love ya! 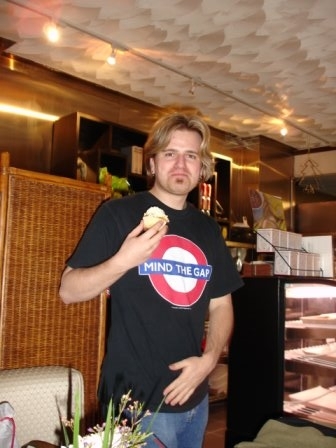 I love that picture of the cupcake - it makes me smile. hey there. Happy birthday. I like your blog. Keep up the efforts! I added a link to yours on mine. I hope you dun mind. Shaz, a fellow food blogger from Singapore. hey v, thanks for dropping by my blog. Hope to see you around more. really nice shots you got. How it shows my non-blogging recently. Those cupcakes looks great - love the umbrella. What a great idea to replace traditional birthday cakes... at least this way, everyone can just dig in - no mess. love it. I am hosting a "fiesta" baby shower in a month and found your blog by searching for fiesta cupcakes. Your margarita cupcakes would be perfect! If you can get the recipe from your friend I'd be eternally grateful! I made these cupcakes this weekend and they were to die for! Thanks so much for the recipe! I stumbled across your blog while I was doing some online research. It seems like cupcakes used to be the domain of wee ones with milk mustaches. Now they've come into their own with sophisticated adult-taste versions! Can you email me the lemon curd recipe? Much appreciated. I am going to make this for one of my boss' birthday!